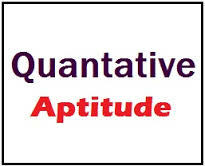 Dear Aspirants practice Quant Questions for upcoming Railway and other exams. Try to solve these Questions and share time taken to solve these Questions and your attempt. Practice Quant Questions for Bank and SSC Exams. (1) If the question can be answered by using statement I alone but cannot be answered by statement II alone. (2) If the question can be answered by using statement II alone but cannot be answered by statement I alone. (3) If both statements I and II together are required to answer the question. (4) If the answer can be found by using any of the two statements alone. (5) If both the statements together are not sufficient to answer the question. 1. A man sells TV sets at profit of 20%. How much total amount he gains in profit? I. He sells 20 TV set. II. He sells each TV set at Rs 12000. 2. What is the age of Ravi at present? I. His present age is 4 times the present age of Ram. II. Five years ago Ravi's age was 7 times the age of Ram. 3. Area of a rectangle is equal to the area of a right-angled triangle. What is the length and width of the rectangle? I. Base of triangle is 10 cm. II. Height of triangle is 20 cm. 4. What is the time taken by Ram from point A to other point B? I. If he walks 25% faster than his usual speed then he reaches 20 seconds earlier. II. If he walks half of his usual speed, he takes 100 seconds more to reach the finishing point B. 5. What is the length of the train? I. It crosses a pole in 10 seconds. II. Speed of the train is 10 m/sec. 1. 3; Both statements are required for answer. 3. 5; Data is not sufficient to find the answer. 4. 4; Both statements alone are sufficient to answer. 5. 3; Both statements are required to answer the question.